As the Fourth Industrial Revolution unfolds across the globe, the future of jobs can be expected to develop with both common and differentiated characteristics across different countries and regions of the world.38 In the near term, our data shows that the mix of prevalent industries in different countries will result in different national combinations of the effects described in the previous section, The Future of Jobs across Industries. Additionally, as global companies choose to differentiate and locate specific job roles and economic activities in certain countries over others due to a range of strategic considerations, there will be a secondary effect on the future of jobs in a range of developed and emerging markets, highlighting the ongoing importance of global supply chains and multinational companies in shaping the structure of the global economy.3940 With regard to the factors determining job location decisions, companies surveyed for this report overwhelmingly cite availability of skilled local talent as their foremost consideration, with 74% of respondents providing this factor as their key consideration. In contrast, 64% of companies cite labour costs as their main concern (Table 7). 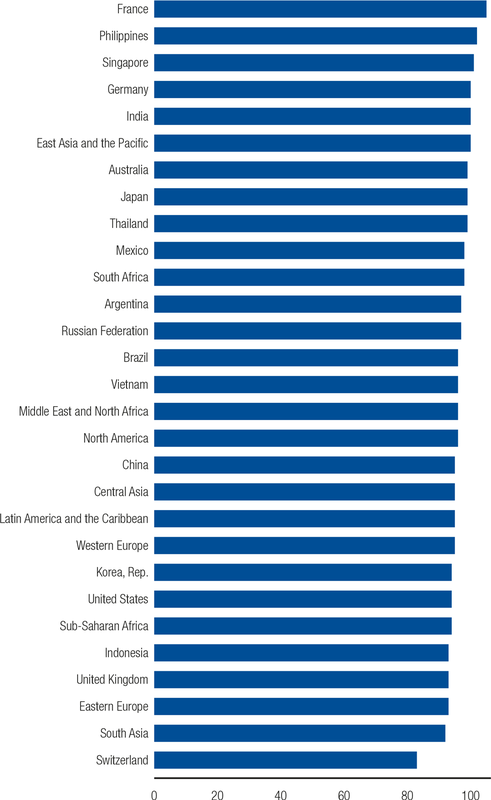 Notably, while we find some evidence of pure labour cost considerations being more important in emerging economies—with, for example, 74% of companies operating in South Africa and a similar share of companies operating in the Philippines highlighting this rationale, compared to 57% in the United Kingdom—skilled local talent availability remains the single most important factor behind job location decisions in these economies as well. A range of additional relevant factors—such as the flexibility of local labour laws, industry agglomeration effects or proximity of raw materials—were considered of lower importance relative to skilled local talent availability and labour cost considerations. Source: Future of Jobs Survey 2018, World Economic Forum. Furthermore, our analysis finds some industry-specific variation with regard to overall labour cost sensitivity relative to skilled local talent availability considerations. For example, across countries and regions, Consumer, Energy Utilities & Technologies, Financial Services & Investors, Infrastructure, and Mining & Metals are industries that tend to emphasize labour cost over skilled local talent availability. In contrast, the Automotive, Aerospace, Supply Chain & Transport; Chemistry, Advanced Materials & Biotechnology; Global Health & Healthcare; and Information & Communication Technologies industries tend to place a larger priority on skilled local talent availability (Table 7). While a detailed discussion of the potential impact of automation on manufacturing in different countries and regions—and the potential for ‘re-shoring’—is beyond the scope of this report, it is worth noting the link between labour costs, skills and investment in automation technologies in advanced and emerging economies. For example, according to one recent study, in 1997, manufacturing value-added per dollar of labour cost was twice as high in Mexico than in the United States. By 2013, this gap had shrunk to less than 15%.41 Provided simultaneous investment in automation technology and labour augmentation in advanced economies continues apace over the 2018–2022 period, it is not inconceivable that shifting comparative advantage in labour costs will affect the industrial structure of economies such as Vietnam through re-shoring of work tasks in sectors such as textiles, apparel, footwear or electronics assembly.42 Indeed, more than half of companies surveyed for this report expected that by 2022 they would be considering adjusting the composition of their value chains in response to the adoption of new technologies, and just under half expected targeting new talent by modifying the location of their operations. However, in order to result in a positive outcome for workers and businesses alike in the midst of these geographically differentiated shifts, lifelong learning and national reskilling and upskilling plans for countries at every stage of economic development are paramount. Part 2 of this report offers a deeper look at technology, jobs, tasks and skills trends within different regions and countries through distinct Country and Regional Profiles. They are intended as a practical guide to exploring these issues in greater granularity and identifying opportunities for countries to build up their future talent pool in a targeted manner. The information provided might also prove useful to evaluate shifting comparative advantage due to new technologies that might affect future company and industry location decisions in relation to various countries in question. Some of the most frequently cited job roles expected to experience an increase in demand across the geographies covered by the report over the 2018–2022 period—as highlighted by surveyed employers with operations in the respective country or region—include Software and Applications Developers, Data Analysts and Scientists, as well as Human Resources Specialists, Sales and Marketing Professionals and specialized Sales Representatives in virtually all world regions. Region-specific roles expected to be in demand include Financial and Investment Advisers in East Asia and the Pacific and Western Europe; Information Security Analysts in Eastern Europe; Assembly and Factory Workers in Latin America and the Caribbean, Middle East and North Africa, South Asia and Sub-Saharan Africa; and Electrotechnology Engineers in North America. Crucial to taking advantage of these emerging job creation opportunities across countries and regions will be the existence of a well-skilled local workforce and of national reskilling and upskilling ecosystems equipped to support local workers to keep abreast of technological change and shifting skills needs. As discussed in the section The Reskilling Imperative (see Figure 7), across all countries and regions, employers surveyed for this report expect that significant reskilling will be needed by a large share of the global workforce over the 2018–2022 period. The expected average timeframe required to retrain or upskill affected workers—either in order to equip the country’s workforce with the skills needed to seize new opportunities created by the trends and disruptions experienced by businesses operating in the country in question, or in order to avoid losing competitiveness due to the obsolescence of the workforce’s existing skillsets——ranges from 83 day for companies located in Switzerland to 105 days for companies located in France (Figure 11). For governments and businesses alike, there is a significant opportunity in strengthening cross-sectoral multistakeholder collaboration to promote corporate reskilling and upskilling among employers in affected countries and regions. Responses by the companies surveyed for this report indicate that, currently, employers expect to primarily seek out the support of their own internal departments as well as private training providers to deliver required retraining and upskilling programmes over the 2018–2022 period. In contrast, across many regions, the least sought-after partners are local education institutions, government programmes and labour unions. This somewhat narrow field of envisaged collaboration partners highlights both an opportunity and a clear need for expanding the range of creative and innovative multistakeholder solutions. 38 For a recent comprehensive overview, see: African Development Bank (AFDB), Asian Development Bank (ADB), European Bank for Reconstruction and Development (EBRD), Inter-American Development Bank (IDB), The Future of Work: Regional Perspectives,2018. 39 Nedelkoska and Quintini, Automation, skills use and training. 40 See, for example: Baldwin, Richard, The Great Convergence: Information Technology and the New Globalization, Harvard University Press, 2016; Reijnders, Laurie S.M. and Gaaitzen de Vries, Job Polarization in Advanced and Emerging Countries: The Role of Task Relocation and Technological Change within Global Supply Chains, GGDC Research Memorandum 167, University of Groningen-Groningen Growth and Development Centre, 2017. 41 Bain & Company, Labor 2030: The Collision of Demographics, Automation and Inequality. 42 International Labour Organization (ILO), Inception Report for the Global Commission on the Future of Work, 2017. 43 Asian Development Bank (ADB), Asian Development Outlook 2018: How Technology Affects Jobs, 2018.